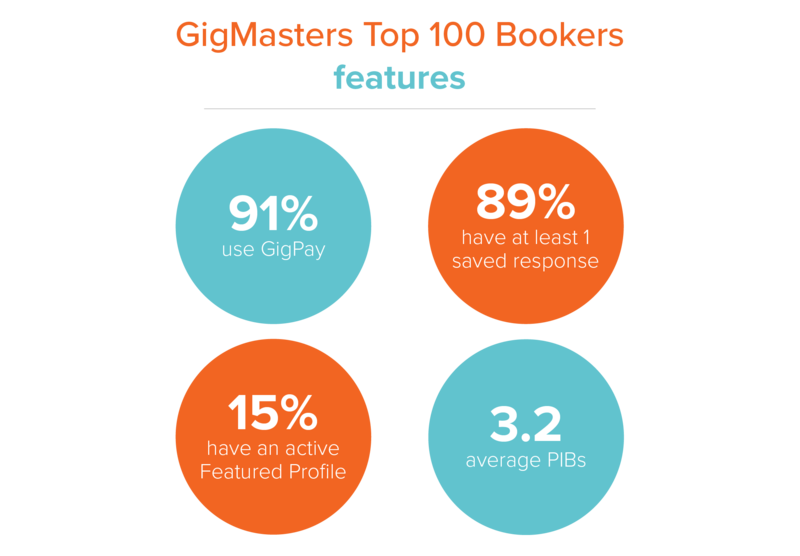 91% are enrolled in GigPay: Over 90% of the Top 100 Bookers are using GigPay to collect online payments from their bookings on GigMasters. GigPay allows vendors to easily receive a deposit at the time of the booking and to also pay booking fees directly from the deposit. Once you enroll in GigPay, you’ll get a badge that says “Accepts Online Payments” posted to your profile and search results so clients can see immediately that you take online payments, helping you get booked! Also, by paying online through GigPay, clients can book with peace of mind knowing that they’re backed by our GigMasters Guarantee. Not enrolled in GigPay yet? Enroll here. 89% have at least one saved response: As we’ve mentioned in past blogs, 1 in 3 bookings go to the vendor that responds first. On GigMasters, you have the ability to create saved responses with different quotes. If you find you’re often typing out the same responses to client requests, try saving a few of them so that all you'll need to do is add a personal touch that speaks directly to the client and their event before sending. Having a draft will save you time and help you respond first to get those gigs! Almost 90% of the Top Bookers have at least one saved response and on average, they have 7 total saved responses. Create saved responses. 15% have an active Featured Profile: If you're a Top Booker, it's likely you are showing up pretty high in search results already on GigMasters since bookings propel your search rankings. However, 15% of Top Bookers have an active Featured Profile to get additional exposure in the category/location of their choosing. Perhaps they're showing up on the first page of results, but not as high as they'd like and are looking for even more visibility. Featured Profiles show up above search results and give vendors a prime spot to get seen by clients immediately. They are very prominent on mobile - take a look at this example. 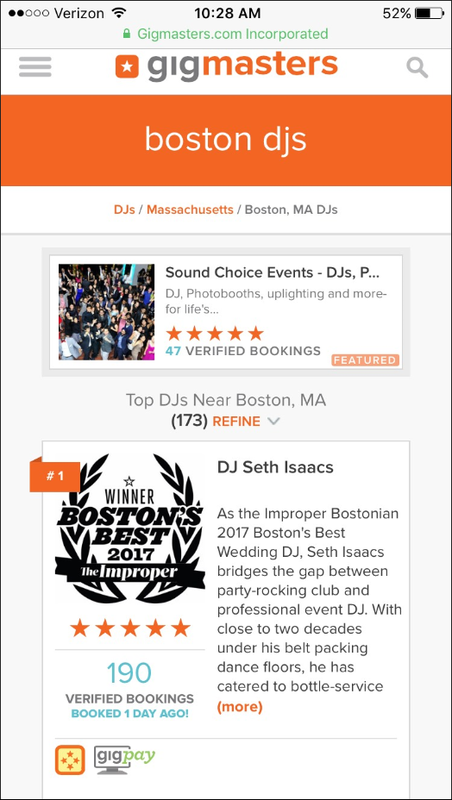 With more than half of clients searching on their mobile device in 2018, Featured Profiles are a great way to get more visibility! Featured Profiles can be purchased for any location/category combination and for as long as you'd like! They also come with a Spotlight which allows you to tell clients more about your business by answering two questions. If you just started out and/or are looking to get more exposure on GigMasters, learn more about Featured Profiles or try one out today! They submit an average of 3.2 Performer Initiated Bookings (PIBs): If you get a client request outside of GigMasters, you can record that in GigMasters and choose to pay the 5% booking fee to get credit for it - this propels your search rankings, allows clients to give you a review, enables clients to pay online (if you have GigPay), and backs clients through our GigMasters Guarantee. If you’re a new member, PIBs are especially important because they’ll help you start to boost your ranking on GigMasters. As our April Top Booked Member said, "Remember, one gig can lead to another 100!" If you missed the first “Habits of the Top 100 Bookers” blog on Profile Habits, you can view it here.